Simply Stewarts: Christmas Memories, part two: A pig in the Nativity? Christmas Memories, part two: A pig in the Nativity? When Luke was little, he received a Fisher Price Nativity. This is something that he only gets to play with during Christmas time, so it is no surprise that it is played with a lot during the month of December. It is sometimes difficult for my son to keep up with all these pieces and to keep them in the proper place. So, fun conversations and happenings take place. Momma, I lost baby Jesus. Well, you better find Him. You cannot have Christmas without Jesus. It makes me laugh as it sounds like he is on the back pew at a Southern Baptist church during a revival and just got saved. 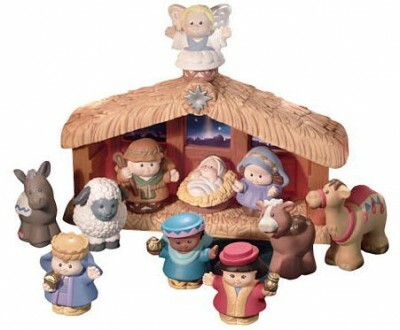 I also find that the Fisher Price barnyard animals tend to show up to take a look at baby Jesus. All of the sudden, there will be a pig on top of the stable, a horse next to the camel, the angel is off at the farm in the silo, and the farmer has come to milk the cow that is beside Mary. All the while, Jesus may or may not even be there! Oh well, if you can have the wise men at the Nativity, I guess it is not too out of the question to have a pig there as well. Or even a farmer.